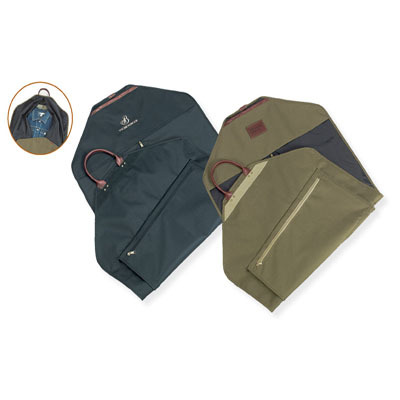 Folds in half to secure under a full-size flap, full grain leather handle and trim, hangers secure inside with Velcro closure, large zippered pocket on front. Size: 25" x 49". *There is a 8 % surcharge on the price of this calendar if it is shipped to California, Tennessee, or Maryland, so the price per calendar shipped to these states will be 8 % more than you see on the website. This surcharge will not be reflected on the order form, but will added to your total and charged on your credit card. Imprint Area is: 6" x 4"
25 1 color(s) imprint at $688 ONLY $27.52 each. 25 2 color(s) imprint at $758 ONLY $30.32 each. 25 3 color(s) imprint at $830 ONLY $33.20 each. 25 4 color(s) imprint at $903 ONLY $36.12 each. 50 1 color(s) imprint at $1,313 ONLY $26.26 each. 50 2 color(s) imprint at $1,402 ONLY $28.04 each. 50 3 color(s) imprint at $1,474 ONLY $29.48 each. 50 4 color(s) imprint at $1,546 ONLY $30.92 each. 100 1 color(s) imprint at $2,468 ONLY $24.68 each. 100 2 color(s) imprint at $2,586 ONLY $25.86 each. 100 3 color(s) imprint at $2,705 ONLY $27.05 each. 100 4 color(s) imprint at $2,823 ONLY $28.23 each. 250 1 color(s) imprint at $5,836 ONLY $23.34 each. 250 2 color(s) imprint at $6,042 ONLY $24.17 each. 250 3 color(s) imprint at $6,248 ONLY $24.99 each. 250 4 color(s) imprint at $6,454 ONLY $25.82 each. 500 1 color(s) imprint at $11,620 ONLY $23.24 each. 500 2 color(s) imprint at $11,981 ONLY $23.96 each. 500 3 color(s) imprint at $12,342 ONLY $24.68 each. 500 4 color(s) imprint at $12,702 ONLY $25.40 each.